The Executive MBA at Loyola Marymount University is designed for mid-career executives who are ready to take their careers to the next level. 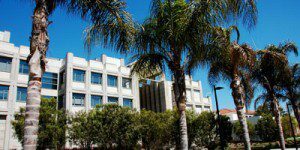 The AACSB-accredited 20-month program meets on Saturdays at LMU’s West Los Angeles campus in Silicon Beach. The Loyola Marymount Executive MBA program boasts Saturday-only classes, small class sizes, a collaborative learning environment, personalized attention, an active alumni network, a focus on ethics and leadership, and an international study component. There is one intake of students each year, and classes begin in the fall semester, in August. The Loyola Marymount Executive MBA curriculum uses actual businesses and case studies as a way to cement classroom concepts into practical, real-world applications. The program uses a cohort structure and shifts from analysis and evaluation to strategic application and execution. The EMBA experience begins with an Executive Leadership Retreat where students meet their classmates, set learning goals, and form study teams and engage in a variety of workshops and team-building exercises. Students may also participate in a workshop with a spouse/significant other addressing the importance of achieving balance between family, work and school. The program consists of five integrated modules plus an immersive International Experience. The five modules are as follows: Leadership and the Language of Business, Leadership to Improve Organizational Performance, Innovation and Entrepreneurship, Strategy in the Global Business Environment, and Leadership and the International Experience. In the summer module, Innovation and Entrepreneurship, students take a one-week domestic trip to Silicon Valley to meet with innovative companies and entrepreneurial individuals who shape policies and decisions. In the final semester, students take a 10-day journey overseas to one or more major business centers to meet with business executives and gather findings for their final research projects. In recent years, EMBA students have traveled to China, India, South America, Southeast Asia and Europe. A distinguishing feature of the EMBA program is the individual guidance students receive from an executive coach. These seasoned business professionals provide unbiased, objective feedback on each professional growth plan as it is being developed. Executive coaches work with their assigned students to facilitate a greater personal introspection and have played a fundamental role in the development of LMU’s EMBA program. The most recent Loyola Marymount Executive MBA class features 24 individual students in five separate cohort groups. About 58 percent of the students are male and 42 percent are female, averaging 34-years old. Students have an average of 10 years of management experience at the start of the program. An average class features 20-25 students. All LMU MBA students and alumni are eligible for career services guidance through the Graduate Career Management Office. Whether a student or alum looking for a full-time position, part-time position, or internship, LMU offers a variety of services to help advance careers. Career management staff will counsel students and alumni at any point on the job-search spectrum, including those coping with career changes, industry changes, job transitions, international challenges and more. Information can be gained through career fairs, industry panels, career development workshops and distinguished guest speakers, giving students the edge needed to succeed. The career management office provides guidance on creating résumés and cover letters, as well as assistance with interview etiquette, salary negotiation and general career counseling. The office also provides access to a variety of online job-search tools to aid students and alumni. Loyola Marymount Executive MBA students also receive an exclusive Executive Coach feature in the program, helping personally guide students and understand their career paths on a personal level. Executive Coaches are experienced professionals that have also undergone training to help others progress their own careers. Executive MBA students will also receive beneficial training from an exclusive Executive Coach, which helps guiding students to their future careers. The Executive MBA program fee is $97,000, which includes tuition, all university fees, books, program software, parking, meals on class days, lodging, and most of the food for three residential programs (Leadership Retreat, first year domestic trip, second year international trip). Costs not included are transportation to and from residential programs and a required laptop computer. Applicants to the Loyola Marymount Executive MBA program must have completed a bachelor’s degree with an acceptable level of scholarship from an accredited institution of higher learning and six or more years of increasing responsibility in professional, management, or entrepreneurial positions. The admission decision is individualized and based on a candidate’s potential to pursue graduate study. Each candidate is evaluated on work and management experience, career accomplishments, potential for advancement, letters of recommendation, personal interview, information provided in the application form, undergraduate and graduate record (if any) and Graduate Management Admission Test (GMAT), if required. International applicants who have completed their postsecondary education from a college or university outside of the U.S. must have their transcripts translated and evaluated by a U.S. transcript evaluation service. Applicants must also send in their GMAT scores, if required, and a nonrefundable $100 application fee. The fee is waived, however, for military personnel and veterans wishing to apply. Candidates for the Executive MBA must have an interview with a member of the admissions committee. Applicants are encouraged to interview early in the admissions process to assess the fit between the program and their experience, expectations, and personal development needs, and to determine if they are required to take the GMAT.